Helping entrepreneurs to grow their businesses, the digital platform offers access to knowhow, practical advice and documents at no cost to the user. Powered by Support Legal’s team of senior lawyers, ScaleUp features a library of go-to articles addressing every stage of the business lifecycle, from inception to exit. Resources help to answer common questions associated with agreements, funding, protection of ideas and the day-to-day running of a business. 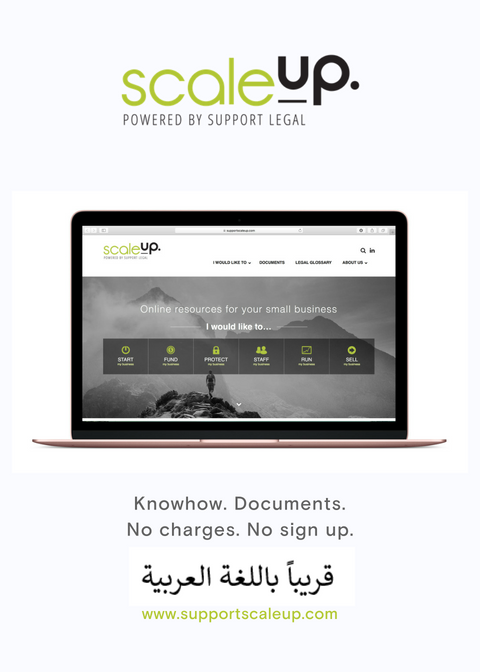 In line with Support Legal’s mission to empower the start-up community, increase transparency, and reduce barriers between entrepreneurs and legal professionals, no subscription or sign-up is required to access ScaleUp content. Using leading contract automation software featuring easy to follow questionnaires, the platform allows users to self-generate bespoke documents in a matter of minutes. ScaleUp Arabic will launch in Q2 2018, to better serve the needs of the hundreds of millions of Arabic speakers, who are under-represented online in terms of content availability.